Born in Gdynia on 1st May 1963. In 1982–1988, he studied at the University of Gdańsk, where he earned a Master’s Degree with a thesis on the Jewish issue in the 1st Republic of Poland during the time of the Four-Year Sejm. After graduation, he worked as a teacher at secondary school no. 5 in Gdańsk, then, in 1989–1993, as an academic teacher at his alma mater, specializing in Modern History of 16th–18th centuries. He has also taught Art History. Since 1990, he has worked as a journalist for the weekly newspaper “Młoda Polska”, then for TVP and Polsat. In 1998, he took up a position as a spokesman of Jerzy Buzek’s government. In 1999–2005, he was a member of the National Broadcast Council. Since 1983, he has been associated with the anti-communist opposition. He participated in the Round Table Talks (February–April 1989), a.k.a. “the young group discussion”. In the same year, he was employed as an official in the training department in the Solidarność National Commission and was a formal member of the Union. He was a member of the Christian National Union from 1990–1991, the Republican Coalition from 1991–1993, and then the Conservative Party. In May 2005, he stood successfully as a Law and Justice (PiS) candidate for the Sejm. In 2005–2007, he acted as the Secretary of State (the Deputy Minister) at the Ministry of Culture and National Heritage. 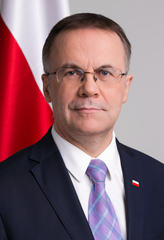 In 2007, he was re-elected to the Sejm for the Law and Justice Party. After an attempt to establish the Poland XXI Civic Movement and the Poland Plus party, in September 2010 he joined Law and Justice; he is a PiS member in the Gdynia District. He won the Pomerania parliamentary election in October 2015 with the support of almost 35,000 inhabitants. During the presidential elections of 2015, he acted as the deputy head of President Andrzej Duda’s electoral staff. On 20th November 2015, he was re-elected as the Secretary of State at the Ministry of Culture and National Heritage. He has been married since 1999 and has a daughter. His interests are history, literature, theology, classical music, and jazz.